For the second time in a month, LBJ talked of a supposed leak of a letter from the Joint Chiefs to Kennedy during the Cuban missile crisis that found its way to Khrushchev. In his previous conversation, he relayed the story to Vice President Hubert Humphrey, who had not been there. This time, he discussed it in more detail–and explains where he got the story from–with someone who was there: National Security Adviser McGeorge Bundy. This country is much too strong, in my opinion, that it would suffer any great setback. We are much stronger than Russia was when she withdrew from Cuba. Within a week maybe people said she had had a rebuff and within a month everyone was complimenting them for having contributed to the maintenance of peace. In terms of the “leak” LBJ mentions, and his implication that it was both unauthorized and undesirable, he may have been missing the point. As Bundy seems to try to point out, the Kennedy administration had used the threat of invasion directly with the Soviets precisely in the hope they would back down before it became necessary. Robert Kennedy, in his secret meetings with Soviet Ambassador Anatoly Dobrynin, had even explicitly told Dobrynin that the President was finding it increasingly difficult to resist the pressure from the Joint Chiefs of Staff for military action against Cuba. LBJ But gosh, he's real inconsistent. McGeorge Bundy Oh, I know that. 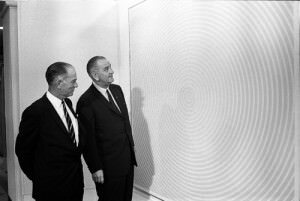 LBJ Following [J. William] Fulbright's theory and talking about how careful and measured they were. Fulbright was dropping bombs on Cuba, as I remember it. LBJ And the Joint Chiefs of Staff, as I understood it, signed the letter. And [General Maxwell] Taylor first agreed with it, and then backed off a little bit that day, the day before. Isn't that correct? Bundy I don't remember Max's position. LBJ Well, didn't they recommend taking them out? Bundy They were certainly--they certainly were. Air strike plus invasion, really. LBJ I was told by my military aide that he was told that they had signed it, that Taylor was on board, that he signed it, that he was going to take it over, that he talked to somebody, and then called them back in and said that he wanted to interpret it a little differently, And he backed away from it at that very moment. And a good many people over there who were gossipers and who are still gossipers were of the opinion that the commies knew about that and that's why [Nikita] Khrushchev came in when he did. They knew that we were getting ready to do this, and they had their leaks. And that it's kind of like [Dwight] Eisenhower's leak. Bundy I've always thought that the prospect of invasion had more to do with the solution than any other one thing. I couldn't prove it, but I just think that it looked awful imminent. Source Tape: WH6602-07-9655, Lyndon B. Johnson Library.